Unlike many other countries, the United States does not have one single governing body that sets education policy for the entire nation. The Department of Education creates some rules. But the way in which schools operate is mostly decided by the individual states. Some say this gives schools more freedoms to serve the different needs of different populations. Yet many experts argue there is a need for a more united effort for exploring ways to improve the education system. This argument is especially common within the American higher education community. For example, the Institute for College Access and Success last month released a report calling for the federal government to improve data reporting. The organization asked the government to create a single measurement of job placements for college graduates. But one organization has decided not to wait for the government to take action. Instead, it is aiming to create one of the largest joint efforts to gather information about the higher education experience in the nation’s history. 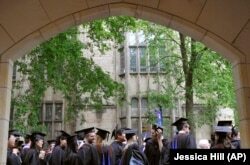 In this May 24, 2010 file photo, future graduates wait for the procession to begin for the graduation ceremony at Yale University in New Haven, Connecticut. Ricardo Torres is the president of the National Student Clearinghouse, an independent, non-profit education organization. He says higher education community members created the organization nearly 25 years ago because of a lack of data reporting on the part of the federal government. The Department of Education does have a system for reporting information about colleges and universities. It is called the Integrated Postsecondary Education Data System, or IPEDs. But Torres argues that this system is lacking in several ways. For example, up until 2017, it only published data on first-time, full-time college students. Torres notes that, before 2017, the system did not look at part-time students and it did not publish the rate of college completion by low-income students receiving federal aid. Also, it still does not look at students who change schools. This kind of information is very important, Torres says. It can affect how soon college students must begin paying back their student loans. And it greatly affects an institution’s understanding of how well it is serving its students. The National Student Clearinghouse has worked with over 3,600 institutions to gather and share this kind of data. In 2017, it sought to expand these efforts by testing a new program: the Postsecondary Data Partnership, or PDP. As part of the testing, three state systems and several individual schools shared as much data as they could related to student access to higher education, their academic progress and, finally, their successful completion of college. In 2018, the PDP expanded to include a larger number of the National Student Clearinghouse’s partner institutions. Torres says the aim is to gather more data from even more institutions this year. This includes information on the kinds of classes students take, their performance in those classes and even their parents’ education background. Once this information is gathered, PDP researchers process the data and present it to the institutions and other organizations. They aim to present the results in a clear, easy-to-understand way. They also make sure the information schools are reporting is correct, which is important considering they identified 6.5 million errors in the data they gathered last year, Torres says. Bruce Vandal says these are exactly the kinds of tools his organization needs to be successful. Vandal is the senior vice president of Complete College America, a partnership of 46 higher education systems and institutions. His group works to make sure that low-income, minority and first-generation students have the chance to attend and succeed in college. Vandal calls the PDP the most centrally organized data collection effort yet. In the past, schools and education organizations were doing their own disconnected research, often repeating the work others had already done. The Education Department may now be gathering more data, but they still have not decided what their goals for that data are or how to use it, Vandal adds. Having one central body gathering and processing all this data reduces work for the institutions and the organizations they work with. Instead, the institutions and organizations can spend more time examining efforts to support students, he says. For example, in the past, many institutions placed students who performed poorly in high school into special lower-level math and English classes. This was seen as a chance for these students to prove they were, in fact, ready to perform at the college level in those subjects. But Complete College America found that a large number of students put in these classes never complete their education. These classes add to the traditional amount of time it takes to complete a study program. So, they increased education costs. Now, Vandal notes, some institutions have begun to place lower-performing students in normal classes, but with additional support services. Ricardo Torres says the value of this data is so clear that other countries have asked his group for advice on how to gather information of their own. We want to hear from you. How does your access to, progress through and successful completion of higher education? Write to us in the Comments Section or on our Facebook page.